TOKYO, October 27, 2015 — Ricoh Company, Ltd. (President and CEO: Zenji Miura) announced today the release of the RICOH AM S5500P, its first 3D Printer under the RICOH brand. Ricoh will begin taking orders on October 30, 2015 in Japan and then expand sales to Europe and other countries. The RICOH AM S5500P, which is capable of producing high-definition and highly durable fabricated object, employs an additive manufacturing method known as SLS®*1. Using this technique, a powdered material is irradiated with the laser for sintering. In addition to the polymer powder materials mainly used with the SLS® method, such as PA*211 and PA12, universally applicable and highly functional materials PA6 and PP*3 can also be used. This product can fabricate automobile parts for functional tests, as well as the parts for end products. With a large modeling area of 550 mm (W) × 550 mm (D) × 500 mm (H), the RICOH AM S5500P can fabricate different kinds of parts at the same time, as well as mold large parts all at once. *1) SLS® stands for Selective Laser Sintering. *2) PA (Polyamide): Nylon. Polymer powder that offers strength and flexibility. *3) PP (Polypropylene): Polymer powder that is light, incredibly durable, and highly flexible. In September 2014, Ricoh launched the Additive Manufacturing Business (AM Business), which focuses mainly on the 3D printers. Up until now, Ricoh has been selling third party 3D printers and providing a complete range of services, from consulting to 3D data design to fabrication. 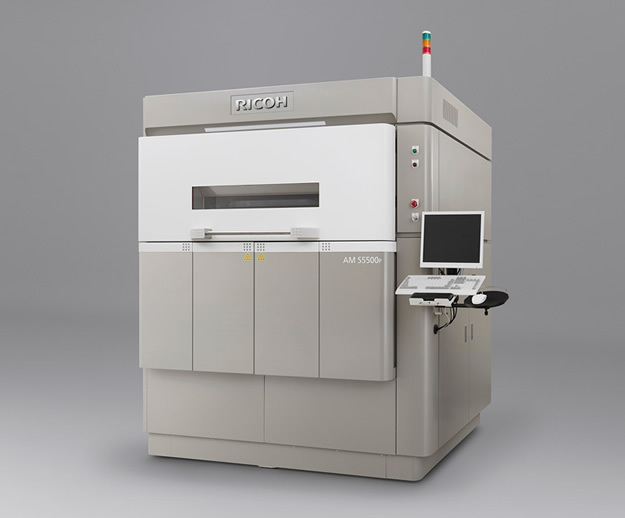 Ricoh will add the new RICOH AM S5500P to the services it has been providing and promote introduction of the product to customers’ design departments and manufacturing departments in order to even more strongly support the efforts of its customers for innovation in manufacturing. Ricoh worked in collaboration with Aspect, Inc. to develop the RICOH AM S5500P. After the release of the product, Ricoh will continue to work together with Aspect on developing proprietary material and enhancing functions. Ricoh will participate in the international exhibition and conference on additive technologies and tool making “formnext,” scheduled to be held in Frankfurt, Germany from November 17 to 20 this year. We will exhibit this new product as well as design and manufacturing support solutions. Ricoh is a global technology company specializing in office imaging equipment, production print solutions, document management systems and IT services. Headquartered in Tokyo, Ricoh Group operates in about 200 countries and regions. In the financial year ending March 2015, Ricoh Group had worldwide sales of 2,231 billion yen (approx. 18.5 billion USD). The majority of the company’s revenue comes from products, solutions and services that improve the interaction between people and information. Information in the news releases is true and accurate at the time of publication. Manufacture, sales, price and specifications of products may be subject to change. SLS is a registered trademark of 3D Systems, Inc. This entry was posted in News and tagged Additive Manufacturing Business, AM Business, Aspect, Inc., Ltd., RICOH AM S5500P, Ricoh Company, Zenji Miura by david. Bookmark the permalink.